For the past seven months, a 16- x 6-foot shack has served as their office, their kitchen, their bathroom and their sleeping quarters. 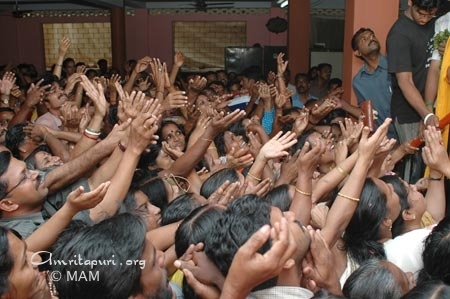 It is from there that they have been managing the construction of the three apartment buildings the Ashram is constructing in Thekkawatta, a village in the Kalutara District of Sri Lanka, as part of its tsunami-relief program. The team comprises Brahmachari Vinayamrita Chaitanya, the head-in-charge of Amma’s Ashram in Chennai, and three devotee-volunteers. 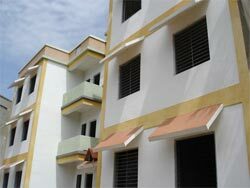 The buildings each have three floors, with four apartments on each floor, creating homes for 36 families. Each apartment has a living/dining room, two bedrooms, a kitchen, a bathroom, and two balconies. The flat roof is fully accessible, creating an additional 2,400 square feet for the inhabitants to share. Br. Vinayamrita says that the houses should be 100-percent finished by mid-July. The basic structures have been completed, but the electrical work and plumbing—all of which the Ashram is doing itself—have yet to be finished. Thekkawatta is a Singhalese area, so almost all the people there are Buddhists. In fact, the construction site is just three kilometers away from one of the largest and most popular Buddhist pagodas in the Kalutara district. 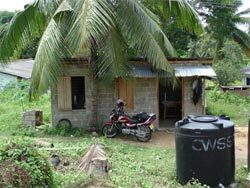 The beneficiaries, who almost all rely on fishing for their income, are currently living in government-constructed temporary shelters near the seashore. Every few days they come up to check on the progress of the houses. The Ashram is also constructing similar buildings for 60 families in Periyanilavanai, a Tamil-populated village in Ampara District. Amma left Amritapuri this evening for her two month long Japan – USA programmes. 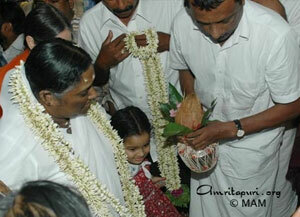 For the past few days Amma had been meeting the Ashram residents seperately. 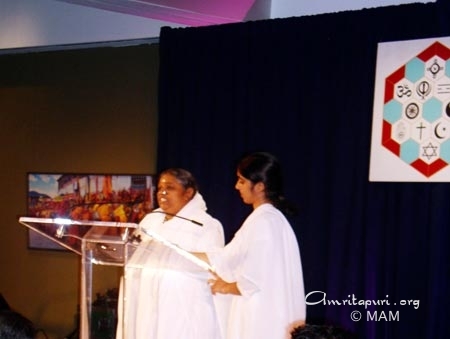 Before leaving for the Japan – USA tour Amma had a meeting with all of the ashram residents, giving instructions on how all were to maintain individual discipline, do sadhana, their specefic seva and also the ongoing tsunami rehabilitation work. As Amma’s car moved slowly out of the ashram Amma extended her hand to her children lined up to bid her farewell – a final touch of love for all of her children in Amritapuri, to be treasured in their hearts for the two months that she is away. First it was the brahmacharinis… then the brahmacharis… then the Western ladies… then more brahmacharis… more brahmacharinis… then the householder ashramites… the Western men… and finally the sannyasins. 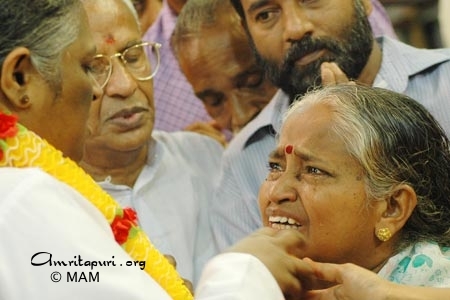 During the past two weeks Amma has given private “room darshans” to all of the 3,000 residents of Amritapuri. It is a tradition that goes back to Amma’s first world tour in 1987—everyone staying behind gets to go to Amma’s room for a few minutes of private time with Amma. On the final day, even Ram, the Ashram elephant, was in line! It is a time to seek advice about one’s seva, receive personal instruction regarding spiritual practices, have doubts cleared and to deepen one’s bond with Amma. For many, it is the only time they go for darshan the entire year. 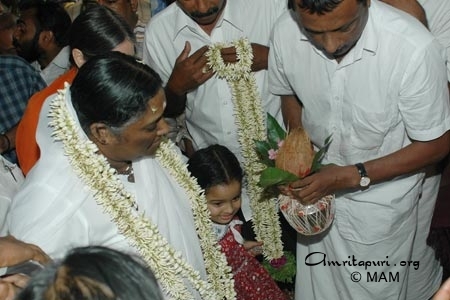 Amma first started meeting residents in her room on May 14th—the very day she returned from her two-week Kerala tour. 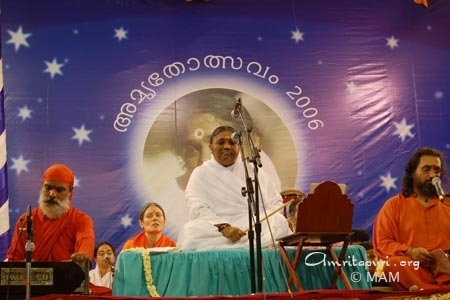 From then until Amma finished late last night, the only hiatus she took was the three days of the Brahmasthanam Festival in Trivandrum. 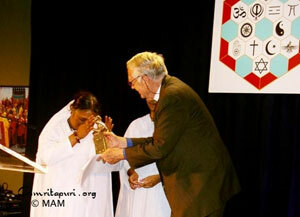 It is truly a special time in the ashram. 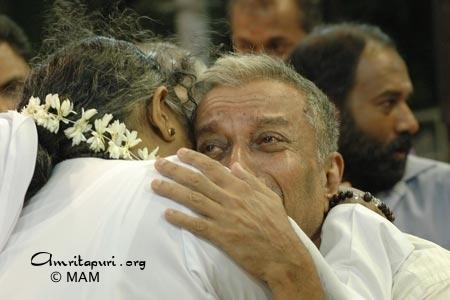 Everywhere you look, you see smiling people talking about the time they have recently spent with Amma. Everywhere you go you hear the question, Did you go yet? Driving north from Hyderabad to Nagpur, the country becomes even more arid and hot. The rocky hills that had previously marked the landscape dwindle in appearance, giving way to a land that is utterly flat and, more often than not, barren. Only a few crops will grow in such conditions—chiefly wheat and cotton, neither of which provides any visual splendour. Yet the bleakness of the region makes the appearance of the occasional sunflower garden all the more dramatic—one is suddenly overwhelmed by acres of yellow. And then, as soon as one crosses from Andhra Pradesh into Maharashtra, things change. Trees are reintroduced, grass appears, rivers start winding through the land. With each passing kilometre, the world seems to rejuvenate more and more. It was just five kilometres north of the Maharashtra border that Amma’s caravan stopped for lunch. Amma got down, walked into the corner of a cotton field and sat down under a mango tree. Soon everyone sat down around her. Wisps of cotton were floating in the air, and a small blonde boy from France captured one and made an offering of it to Amma. Everyone sat watching Amma adore it. In Amma’s hands, the wisp was made precious. 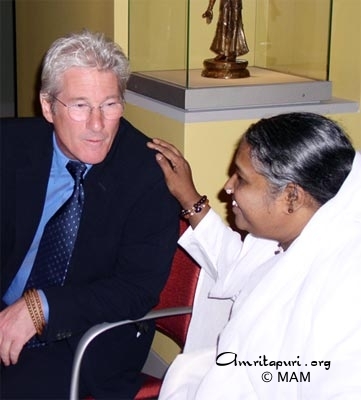 It was as if, to Amma, nothing could have been more miraculous or beautiful. Maybe it was just a joke, but for those who have studied the Upanishads, Amma’s words had a haunting ring to them. Did she have any idea how perfectly in line with the Upanishad her question had been? Being the only one in the cotton field falling into neither the category of “those who know” nor of “those who don’t know,” Amma alone was truly fit to speak on the subject. Upanishads don’t only take place in the Himalayas in the ancient past, but anytime a seeker of Truth comes to a Spiritual Master with an earnest desire to know Reality. 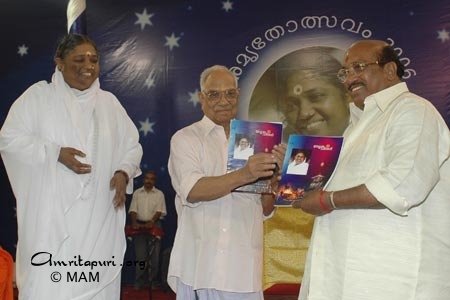 Amma then compared the experience of one who has attained God realization to that of a lover in the presence of their beloved. But whereas the bliss and happiness of the lover is limited to the time he is in the presence of his beloved, for one who has attained God realization the Beloved is everywhere—within and without—and thus similarly ever-present is his bliss. To illustrate what happens when we become attached to the relative beauty of objects, Amma put forth the example of someone marrying Ms. Universe. When they get married, he is in bliss, as he has finally won the love of his life. But at the same time, many boys across the world become depressed upon learning that she is no longer available. “Perhaps they even start taking medication for depression,” Amma said. But after some time, the husband and Ms. Universe begin fighting, and the husband also begins taking anti-depressants. Amma then further bore out the irony by saying how, upon learning of their divorce, the hope of the boys throughout the world is reawoken. Amma then told everyone they should either turn inward and look for God there or try to see God in everything in the world around them. She then gave two examples of devotees who followed the latter path: the gopis of Vrindavan and Sage Narada. The gopis saw Krishna in everything and everyone, and Sage Narada never took a breath or a step without repeating his mantra. Amma reached her ashram in Kaimanam, Trivandum at 3:00 pm. She was greeted by hundreds of devotees who were busy making the final preparations for the Brahmasthanam Festival that will begin there tonight and will finish up Monday morning. Amma’s room is on the ashram’s first floor, a balcony level overlooking the main temple. Upon Amma’s arrival in Trivandrum, it is a tradition for her to walk upstairs and shower flower petals upon the devotees gathered below. This year’s visit was no exception. 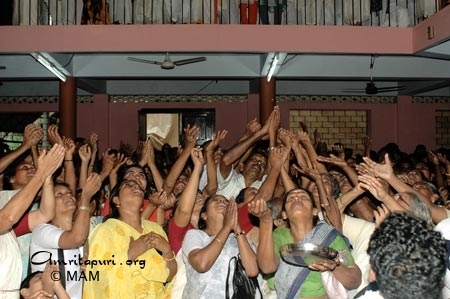 The devotees chanted “Om Amriteswaryai Namah” and reached out for Amma like baby birds crying for what the mother has brought back to the nest. 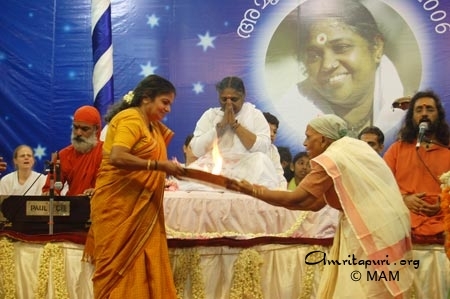 It was a rather intimate crowd, so most of the people standing below could see Amma very easily. But Amma was not satisfied with her view of them. So Amma bent down, lowering her head to the railing so as to be able to see the few people standing outside of her line of sight. Such a simple gesture. So spontaneous. A gaze so full of love it brought tears to all the eyes it reached. 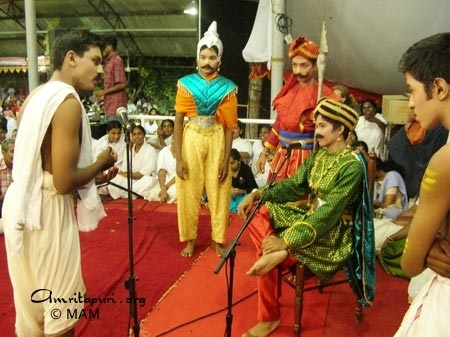 In the temple, the devotee prays for the god’s kadaaksham, who says prayers go unanswered? The temple doors open and the devotee unburdens his heart. For how many lifetimes we must have prayed for a god we could not only see but also touch. * Kadaaksham literally means “a look from the corner of the eye.” In a Hindu temple (especially Siva and Devi temples), the idol faces, and looks, straight ahead, and one does not stand directly before it. Thus, eye to eye contact can only come from God blessing one with his kadaaksham. Today Amma blessed AIMS Hospital’s new “mobile medical unit.” The unit will bring the state-of-the-art medical care of AIMS to rural areas via its satellite. Dr. Prem Nair, the Medical Director of AIMS, and Dr. Kumar Menon, a doctor working out of the unit, gave Amma a quick tour of the unit’s facilities. 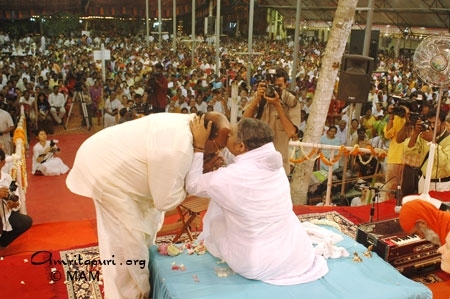 Amma then requested that all the ashramites chant Om lokah samastah sukhino bhavantu as she performed the arati. The unit, which is as large as a city bus, contains facilities for X-ray and ECG, as well as a pathology and bio-chemistry lab. Direct Relief International ( a U.S based NGO) has supported in setting up of this van while Indian Space Reasearch Organisation ( ISRO) provides the satellite-technology and connectivity. AIMS doctors have already used the vehicle for a three-week-long medical camp in Karaikudy, Tamil Nadu. It will soon be used to tend to residents of the tsunami-affected areas of Kerala and the tribal areas of Palakkad, Wayanad and Idukki on a weekly basis. Since its inception in 1997, the Interfaith Award has been presented to 11 individuals who the ICNY feels are doing exceptional work in fostering peace and harmony between the diverse religions of the world. These include 1989 Nobel Peace Prize Laureate His Holiness the Dalai Lama, 1984 Nobel Peace Prize Laureate Archbishop Desmond Tutu, 2003 Nobel Peace Prize Laureate Shirin Ebadi and U.S. President Bill Clinton. 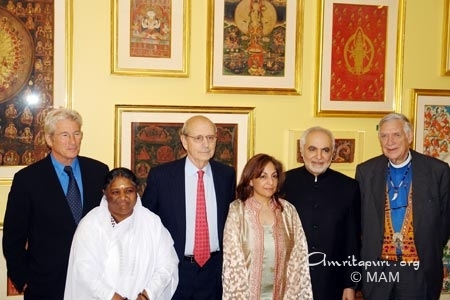 This year, five others were honored aside Amma: 2005 Noble Peace Prize Laureate Dr. Mohammed Elbaradei, Director General of the International Atomic Energy Agency; U.S. Supreme Court Justice Stephen G. Breyer; the renowned American actor Richard Gere, for his work as Director of Healing the Divide and as Chairman of the Board of the International Campaign for Tibet; and the pair of Imam Feisal Abdul Rauf, the Imam of Masjid Al-Farah, and Daisy Khan, the Executive Director of the American Society for Muslim Advancement. The award is named after the founder of the ICNY, the Very Reverend James Parks Morton. Reverend Morton founded the ICNY after retiring from his service as Dean of the Cathedral of St. John the Divine, the Seat of the Episcopal Diocese of New York, in 1997. He has been the ICNY’s president ever since.